Orienteering is an exciting, challenging sport. The aim is to navigate around a number of control points marked on a specially drawn map in the quickest time possible. The challenge involves picking the best route and successfully navigating it as quickly as possible. Orienteering is a very flexible sport and is suitable for all levels of fitness and all ages – competitors at orienteering events range from age 6 to 90! There is absolutely no obligation to run whilst doing an orienteering course, and beginners usually find they are better off going fairly slowly to concentrate on reading the map accurately rather than rushing round. Although the top orienteers are very physically fit, it is rarely the fastest runner who wins – rather the person who can combine running with map-reading and complex decision-making at speed. At the top level, orienteering can be a highly competitive sport, and our elite class athletes compete at a very high level in world competitions. But the majority of people participate in the sport for fun, and there are events throughout the year catering for the very widest possible range of ages and ability levels. The social side of the sport is very important too, and you will soon meet many other like-minded people from all walks of life. Where does orienteering take place? 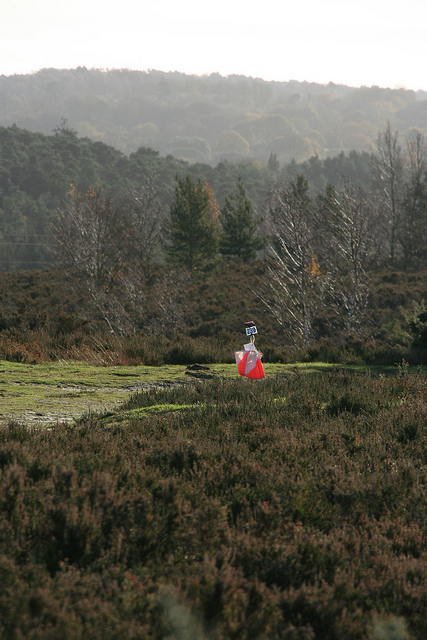 Most orienteering events are held in areas of natural beauty, usually forests or heathland. It is a superb way to get out into the countryside and into beautiful terrain which you would otherwise never have visited, whilst enjoying an adventurous sport at the same time. Smaller orienteering events can take place in country parks or even around the streets of Poole! The best way to try the sport is to come along to an orienteering event and try a course. There is no need to have any coaching or practice beforehand – first-hand experience is the best way to try out the sport. There are various types of event on offer, but all will have courses suitable for beginners. Orienteering events are most commonly held on Sunday mornings, with the peak season being between September and May. However, there are also many other types of event, including evening events held midweek during the summer months, and urban street orienteering events held during the winter. For details of upcoming events see the EVENTS pages. This includes details of forthcoming events organised by Wessex, as well as links to details of those organised by other local clubs as well as regional and national events. Who are WESSEX? Should I join? Any newcomers to the sport are welcome to come along to a few orienteering events before joining the club – come along and try out the sport and see if it is for you. If you enjoy your first few events you should look into club membership, which contains many benefits – full details about WESSEX and how to join the club can be found on the JOIN THE CLUB page. What happens on the day of an event? You should find directions to the event, along with any other details such as timings, on the website of the organising club. Most orienteering events will be signposted when you get close to the area – look for small red and white signs with arrows on them! When you get to an event the first thing to do is to find the “Registration” area. This is usually to be found in a large open tent so should be fairly obvious, but it may be run out of a car (which should have a few signs on it!). At the Registration area you will find details of the courses on offer, which should set out the length of course as well as the “difficulty” of the navigation required. Beginners are recommended to do easy or medium courses on their first few attempts. You may think the easier courses seem quite short, but navigating using an orienteering map takes a bit of practice – you can always try the longer courses when you have got the hang of the easy ones! Many events have “colour-coded” courses, where the colour represents the length and difficulty of the course – the shortest and easiest course is usually the White, with the longest and hardest usually being the Brown. Beginners should probably try a White, Yellow or Orange course – perhaps a Light Green or Red if you want to try something a bit harder or longer. Green, Blue or Brown courses should certainly not be attempted until you have tried several orienteering events first. At your first few events, it is always recommended that you ask for help and advice from one of the organising officials, who will be only too happy to help you. If you cannot find an official, ask anyone at all – orienteers are a friendly bunch and will always take the time to help newcomers! When you register, at all but the smallest events, you will usually be given your electronic timing SI card – this usually takes the form of a small red plastic chip, which you can attach to your finger. This will be used to time you through each of the checkpoints on the course. Once you have registered, and changed into your kit, you will need to make your way to the “Start” – this will always be signposted from the car park. When it is your turn to start you will pick up the map, and away you go! What does an orienteering map look like? In short, probably nothing like any other map you have seen before! Orienteering maps are drawn to a large scale, most commonly 1:15,000 (1 cm=150m) or 1:10,000 (1 cm=100m) and use an internationally agreed set of symbols. These are logical and easy to learn, and you will absorb much of the information simply by attending your first few events. Most orienteering maps include a detailed key. WHITE is used for wooded areas which are easy to run through. GREEN is used for thicker wooded areas which are harder to run through – the darker the shade of green, the thicker the forest is. YELLOW is used for open areas – a solid yellow for grassy spaces such as playing fields, and a paler yellow for rougher terrain (‘rough open’) such as heather. BLACK is used for most man-made features such as paths and tracks, and also rocks and cliffs. BROWN is used to show landform, including contour lines, gullies, pits and small hills. BLUE is used for water features such as lakes, ponds and streams. 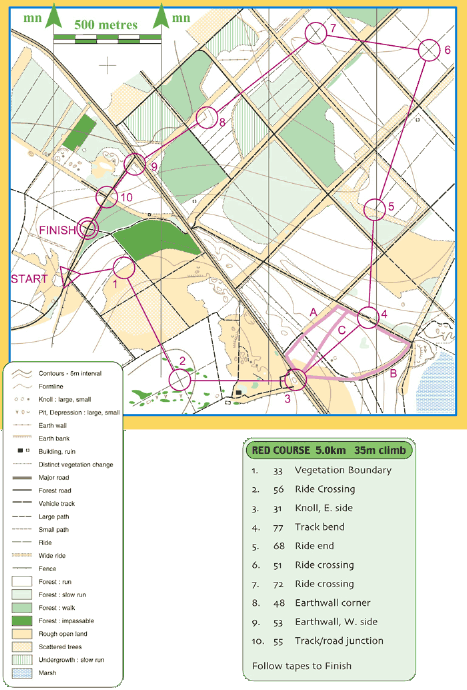 A sample orienteering map is shown above (taken from the British Orienteering website). This includes a typical orienteering course, a key of symbols (bottom left) and a list of descriptions of each of the control points (bottom right) – see below for more explanations of these. The course on this map is a Red colour standard course. You will see that the Start is marked with a triangle, each of the control points are marked with a circle, and then the Finish point with a double circle. 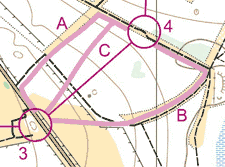 This notation is used for all orienteering courses (although most maps will not include the words “Start” or “Finish”, so remember that the Start is a triangle!). You will always be at the Start point when you pick up your map (this will be marked with an orienteering flag on the ground). The course above has 10 controls to visit – note that you must visit the controls in the correct order, 1-10. The route you take between the controls is entirely up to you. The control description sheet (see bottom right above) contains details of the control codes and a description of the location of the flag. For example, control number 1 has code 33 and is located at a vegetation boundary (i.e. the boundary between some forest and open land.) When you find the control with code number 33 you will know you have found control number 1 – “punch” it with your SI card, and move on to number 2! A. Go north up the road until you reach a path on your right. Follow this until it passes through a gap in the fence and then continue along a wide ride. When you reach the vehicle track, turn right (south east) and follow it for 150 metres, bringing you to control 4, code 77. B. This time you go to your right (due east) across the rough open land until you reach the fence bend. Follow the short section of fence until a wide ride is reached at the next bend in the fence. Now follow the ride as it curves around to the left. Upon reaching the vehicle track, go left for 250 metres until you come to control 4. C. The first two ways involved going around, following tracks and rides, but you could follow a more direct route, using a compass and going straight across the rough open then through the open forest until you reach the vehicle track. If you do, it will be best to ‘aim-off’ to the left, so you can know that you need to turn right to control 4. If you go straight for the control but can’t see the control when you reach the track, you won’t know which way to turn. Although slightly longer and a bit slower, aiming-off can save time in the long run. What do the controls flags look like? The picture here shows what you are looking for. All orienteering controls look like this, with a red and white marker and control code number so you can check you have found the right control – you can see that this control has code number 115. You “punch” your SI card by inserting it into one of the red boxes on top of the stake. Your time finishes when you punch the Finish control (at the double-circle). You should then proceed to the “download” computer (usually back in the car park), where your SI card will be read to confirm you have visited all of the controls in the correct order. You will then be given a print-out of your total time, along with the time you took between each control. Note that even if you don’t manage to complete your course, you must always go to the download point, so that the organisers know you are not still out in the forest and send out a search party for you! Overall results for the event so far are often placed on display somewhere in the car park. Complete results will usually be published on the organising club’s website within a day of the event. As well as overall results you will be able to see how long every competitor took between each control – by comparing times you can see which controls you did well on, and which ones you lost time on. Hopefully you will enjoy your first orienteering experiences and be keen to come back for more. Look around in the car park for leaflets advertising forthcoming events and take any that look interesting. Keep checking the WESSEX events page (with its associated links) for details of forthcoming events. A good way to become more involved in the sport and meet other club members is to join the club. Information about WESSEX and how to join the club can be found on our JOIN THE CLUB page. Once you have completed a few orienteering events, you may be interested in working towards some of the orienteering award schemes that are available. These are a great way of gaining some recognition that your orienteering is improving. We hope to see you in a forest soon!